Wood used for decks must resist rot and be able to stand up to the elements. 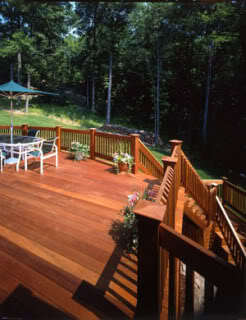 Therefore, choosing the type of wood for your deck should be carefully thought out. 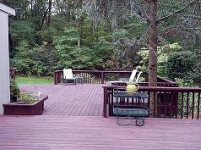 Consider speaking to a local carpenter about the best wood choice for decks in your area. Many homeowners choose treated lumber for their deck frame and supports, and a more attractive wood for the floors, railings and steps. Western red cedar, sustainably grown and harvested in the Western US and Canada, is a durable, stable softwood, which is available in all grades. While Western red cedar is resistant to insects and decay, it is relatively soft and quick to weather. Applying a preservative treatment and sealer, containing either pigment or UV filters, will prevent weathering and keep the deck looking good for many years. Western red cedar is reddish brown and ages to silvery gray. Good quality cedar can last up to 30 years. Redwood is a lightweight softwood available in several grades. Best for decks is the clear heart grade, as it has a high resistance to decay. The clear heart grade contains few knots and is tight-grained. Redwood comes in several colors, from red to a dark reddish-brown. The wood weathers to a yellowish-red quickly. Some redwoods become gray over time. Prolonged moisture will cause the wood to blacken, although applying a sealer will help prevent this discoloration. Genuine mahogany has a beautiful “woven” look to its grain. Not all mahogany has the resistance to decay needed for outdoor use. The brown and medium to dark red species are more resistant to decay. There are several different mahogany types on the market, which should not be confused with each other. Quality Honduran mahogany, which has become quite rare due to non-sustainable forestry practices, is now reserved mainly for interior woodwork and fine furniture. Cambaras mahogany, imported from Brazil, is the most commonly used for decks these days. Meranti wood, aka “Philippine mahogany” or “luan,” is somewhat less popular than Cambaras, due to its color variations. Ipe (pronounced E-pay) is a South American wood. It makes for an extremely durable, low-maintenance wood decking material. Some of Ipe’s positive qualities include: resistance to fire, insects, chipping, cupping, twisting and splintering. Because Ipe is very dense and heavy, which makes it hard for carpenters to cut, labor and installation costs tend to be higher than with other deck woods. Ipe may be sealed or left alone to weather to a silvery gray. 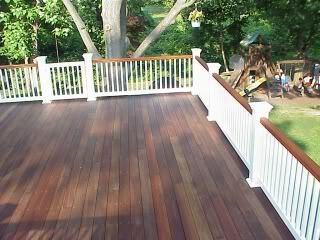 Ipe decks can last 20 years or more.